We, the optician’s are always having troubles to explain to customers about different types of lens indexes. There are some displays which can show to the patient about various thickness according to different index selection. Most of the time it will work fine. But as you know, thickness will vary according to the diameter too. And most of us need to have a diameter chart in hand to check the diameter. 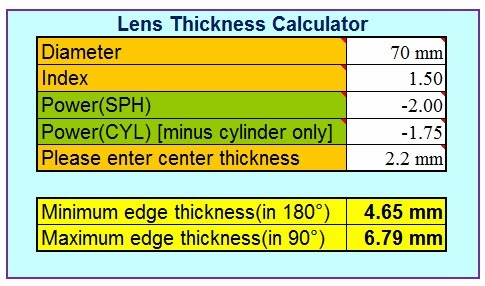 The first section will help you to find the thickness of a lens according to its index and diameter. This is actually helps me quite a bit. I never really understood much about lens indexes before. I'll have to ask an ophthalmologist to learn more about my specific glasses, but this helps a bit. I think that many of us are unfamiliar with lens indexes. I think that most people may feel uncomfortable if their glasses are too thick. Looking like Steve Urkel is currently fashionable among hipsters; however, in the near future it may not be nearly as acceptable. I am just glad that opticians can provide the tools to see the world clearly.